Hosted by Jon Kulp on 2019-04-04 is flagged as Explicit and is released under a CC-BY-SA license. Tags: Music, Piano, Keyboard, Musical Instruments, Player Pianos, Recording Devices. In this episode I talk about the Yamaha Disklavier DKC500RW that's in my office at work. This is a very high-tech player piano and one of the coolest pieces of music gear I've ever seen. Music to ears, literally. That disklavier must be really high tech as it can replicate playing so well. And watching the video of disklavier playing was really nice bonus. This reminded me of time when as a wee lad I made a trip to museum of mechanical music and they had completely mechanical piano that could play different dynamics, flourishes and what not. Diskette is the German word for floppy disk. Klavier is the German word for piano. Tastatur is the German word for keyboard (at least in terms of computers). A pianos keyboard would be called Klaviatur. So Disklavier can be split into Diskette and Klavier. Ok but it wasn't the "Well-Tempered Piano"
But remember, in 1722 Bach wrote Das Wohltemperierte Klavier, and at the time the "piano" as an instrument did not exist. It had to mean either keyboard or harphsichord or clavichord. Keyboard is most generic. I’m not by far music “literate” but the technology in this is so mesmerezing. I’m wondering it the tech exists for other types of instruments, i.e. wind, percussion. I loved this! It's a magnificent instrument. I never knew there was anything quite so sophisticated. I watched the 'Music Machine Mondays' on the Wintergarten Youtube channel a couple of years ago. 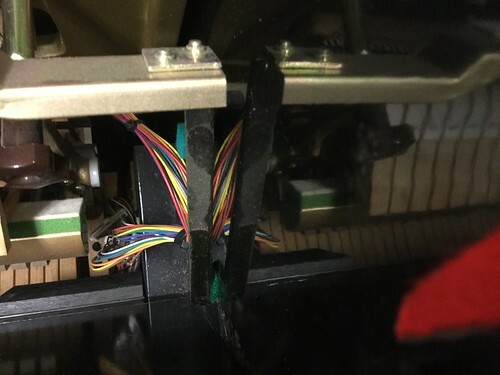 They visited the Speelklok Museum in Utrecht and looked at the marvels there (playlist at https://www.youtube.com/playlist?list=PLLLYkE3G1HEBO1slIc1RRfcfSsGyv2oMu) but this Disklavier is a significant evolution of these machines. Listening to your show I was reminded of a thing I liked to listen to when I was a kid: 'Sparky's Magic Piano' (https://en.wikipedia.org/wiki/Sparky%27s_Magic_Piano). It was often on the radio on Saturdays on a children's music programme. This was probably in the 1950's. How far away are you? It was an interesting show, thanks. First of all, this has been one of my favorite shows of all time. What a fascinating musical instrument, not to mention a cool piece of technology! "I was working at the Library of Congress in Washington, DC, one Summer..."
Dude, it's possible that you've covered this elsewhere, but I'd listen to a whole show about how that happened. It's always great to hear from you! Hi Windigo, thanks for the comment. Yes, I did work at the Library of Congress in the summer of 1993 as a "Junior Fellow," a paid internship that was quite prestigious. I don't know if they still have this or not. It was an amazing gig for a musicology nerd to get to work in the Music Division helping to process the recently acquired archives of Aaron Copland. Maybe this *is* worth an episode of its own! Dave, sorry it took me so long to respond to your very thoughtful comment. I appreciate the link to the self-playing instruments video podcast. There are some really good ones in there. I'm especially impressed by the Self Playing Steinway Duo-Art Piano - recorded by Sergei Prokofiev. That one is nearly as faithful to the actual playback as the Yamaha Disklavier, but is limited by the length of the paper that is recorded on. It's an analog equivalent, incredibly accurate in its reproduction. There were earlier ones, too. That whole phenomenon would merit an entire series but I don't know that much about it haha!